The Mona GeoInformatics Institute (MGI) is celebrating its 10 year anniversary in 2014, and its flagship product, JAMNAV, also celebrates its 5th Anniversary. As such, MGI is having a special Five10 Promotion for the entire year. 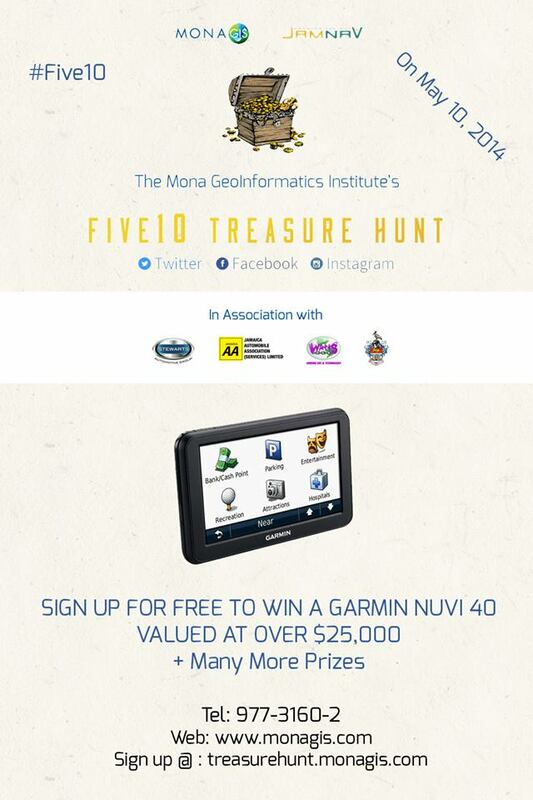 On May 10, 2014 MGI will be hosting Jamaica’s first GPS Treasure Hunt, in association with Stewarts Auto Sales, Jamaica Automobile Association, University of the West Indies and Watts New. The Grand Prize will be a Garmin Nuvi 40 loaded with JAMNAV and USA Maps, along with several other Five10 MGI & JAMNAV Memorabilia, as well as products including gas vouchers, movie tickets, restaurant vouchers, phone cards and more! Read more here treasurehunt register now. MonaGIS serves as the GIS hub for the University of the West Indies Mona Campus. In addition to serving the campus by delivering GIS courses for various departments and participating in campus research activities, MonaGIS provides GIS services to the public and private sectors. MonaGIS can provide analyses, recommend detailed solutions, and design crucial components for any organization’s GIS needs. MonaGIS is the only organization in Jamaica that can provide advanced geographic information science solutions. weblog. Is that this a paid subject or did you modiy it your self? I am a very frequent visiting Jamaica numerous times each year. I would very much like to purchase the required MGI developed GPS maps OR the GPS itself. How much would it cost to have my current Garmin GPS programmed with your most current Maps? How much is it to buy the full GPS new with Jamaica maps pre-Loaded? How do I go about having this done? Where do I go? How long does this take (ie. as one waits?)? Is it simply an SD Card or is it a digital upload to the device? Please someone advise? I would be most grateful as, otherwise, the only alternative, it seems, is to rent one from AVIS at $11.00 U.S. Daily, which adds up over multiple trips annually. Thank You so much!